Here’s a gift from Talo, Punakha: Kunzang Lhaden, aged 12, singing a soulful rendition of “Mitse Dina”, a soundtrack by Namgay Jigs from the movie “Jigthar”. Kunzang learnt this song, and others, by listening to BBS Radio. I was in Puankha over the weekend to participate in a friendly game of archery in Talo. The game was organized by the local people to celebrate the inauguration of the Talo Sherda library by Her Majesty the Queen Mother Ashi Sangay Choden Wangchuck. Built by the Zhabdrung, Talo’s historic archery grounds have seen fierce competitions among many successive generations of the neighboring villages of Talo and Nobgang. And the tradition of the grueling four-day archery challenge between these two villages continues to be the highlight of the local calendar even today. This week’s photo features team Talo-Nobgay distracting Mila Tobgay, our ace shooter, as he prepares to deliver his arrow. 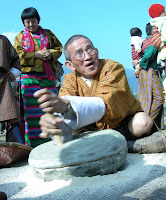 No less than 350 farmers are participating in the Folk Life Festival in Punakha. The three-day festival, which is organized jointly by Tourism Council and ABTO, was inaugurated yesterday by HRH Dasho Jigyel Ugyen Wangchuck. Though the festival was originally planned in 2005, it is said to resemble, in content and style, the hugely successful Smithsonian Folk Life Festival featuring Bhutan in Washington D.C earlier this year. I like the idea. We need to diversify our products for tourists. And we need to expand the tourist “season” to include the sunny winter months. This festival helps in both fronts. Plus it allows Bhutanese to learn, enjoy and celebrate our culture. I like the venue. The weather in Punakha is balmy at this time of the year – perfect conditions for the wide range of outdoor activities required for the festival. A big plus is the support to the local economy. The festival cost Nu 1.5 million, most of it would have been spent locally. I’m not sure about the turnout. I counted only 11 tourists yesterday. That’s bad. But if the festival is marketed well, and in advance, there’s potential to attract big numbers. I’m disappointed. Only 12 tour operators showed up yesterday. That’s 12 out of about 400 registered operators, most of who complain about the scarcity of tourism products. The festival is a viable product. Go check it out. I’m happy. The farmers did not just put on a show. They genuinely enjoyed themselves. Whether they were cooking or playing archery, dancing or weaving, pounding rice or extracting oil, they had fun. And that is important. I’m hopeful. The festival was done well. I hope it’s organized every year. Tourists and farmers would enjoy that. I certainly will.